I admit I’ve been stuck in a bit of a dinner rut. I’m on a low carb diet and have been making the same meals over and over again. Poor John has complained to me that he is sick of eating the same meals all the time. He said no more frittata! I could never tire of it, but John said he needed some variation. I guess I can see his point! My introduction to eMeals came at the perfect time. I was frustrated trying to plan meals for the week that would still fit into my diet and that would be something my family would eat. If you need a meal plan, but have no idea where to start or are having trouble following through, eMeals is the perfect solution. They take the planning out of the equation and all you need to focus on is the actual meal preparation! There’s a few different add-ons that you can choose from like the Healthy Lunch Plan and the Breakfast Plan that include five meal ideas each week. After you pick your plan, each week you’ll be emailed a weekly meal plan that includes seven recipes (entree & side dish) and a weekly grocery list organized by section. The produce is all listed together as well as the other categories so you can easily shop and check things off your list. If you customized your plan to include a specific grocery store, you’ll also see the weekly sales at the store. The plan I picked was the Low Carb meal plan for a family. I was emailed recipes and a grocery list for the week. The recipes sounded so yummy and I couldn’t wait to try them out. I liked that they were easy to make and many of the ingredients I already had on hand in my house. You can also see the prep time, cook time and total time it will take to make these meals as well as how many servings they make and net carbs (since mine is the low carb plan). So far I’m really happy with my experience with eMeals. I love the variety and how it keeps me organized and still on track with my diet. I don’t feel the urge to go out and pick up fast food or ready to serve food at the grocery store because I know what’s for dinner. My favourite recipe so far is the “Forget the Bun” Burger Salad. I miss eating burgers! This salad was the next best thing. 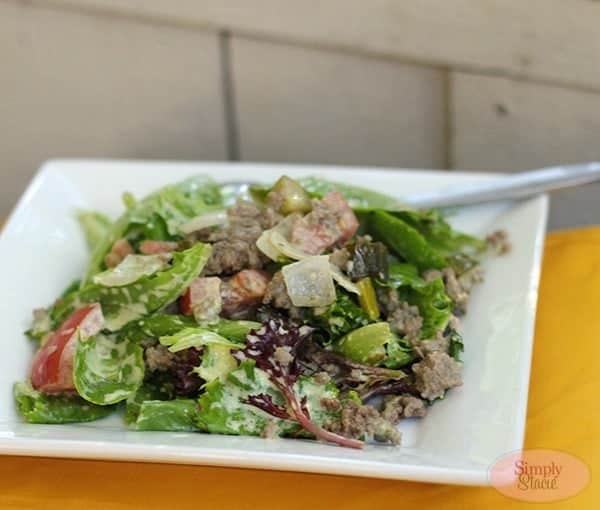 With cooked ground beef and onions, juicy tomatoes, chopped pickles in a dressing made with mayo and mustard on a bed of lettuce, it was amazing! It was 11 net carbs each serving. I’ve got the 12 month plan ($58), but you can also purchase the 3 month plan ($21) or 6 month plan ($35). You can also change your plan if you decide you want to try something different. For now I’m sticking with Low Carb though I might decide in a few months time to give Clean Eating a try. If meal planning is stressing you out or you are finding yourself cooking the same things over and over again like I was, give eMeals a try and see how you like it. Connect with eMeals on Facebook, Twitter, Pinterest and their blog. This looks awesome, I’m always stuck on what to make for dinner too! We are vegetarians so this is great that that’s an option. Thanks for the review! This sounds like a great site as i have lost my creativity for meal planning! We seem to eat the same few meals over and over again! This looks great, meal planning can be difficult. I will take a closer look at this site. Meal Planning is always difficult because it is something we have to do all the time with a budget. We want variety so this will help to get some Ideas…Thanks ! I find that we don’t plan our meals very well. We have been talking about getting a meal planner and help us actually organize our meals, but we never get around to it. Perhaps emeals is the way to go. Running out of ideas and will check out e-meals, thank you! I like the healthy options! Very useful and convenient. Love the idea of getting the recipes and the grocery list all together for easy shopping and prep. It’s great that they offer different plans and let you have some customization. My daughter is the cook in our house, and she used to really enjoy all of the planning and experimenting. She was very sick and now doesn’t want to plan. I can see where this would really help some people since it’s already laid out. This sounds great! My step-daughter is struggling with creating good gluten-free menus and this may be perfect for her. This sounds wonderful! My adult daughters will love it! I’m going to pass your page on to them; can’t wait to look at it further! This looks like a very useful site for those not sure what to make or not having enough time to plan it out. The dishes you named sounded dellicious. This sounds like a great service. I have been feeling in a bit of a dinner rut myself lately and this would definitely help! This looks awesome, the great answer to the eternal question — What cook for dinner? These emeals plan sounds great because it is needed to plan what I am going to make for the week. I also get tired of making the same old meals and need some help with knowing what to make. Emeals is a great tool for planning meals. That makes meal planning really easy! I like how you can design your plans according to food preferences. Sound great, especially Almond-Crusted Pork with Homemade Salsa served with Ranch Coleslaw. Hey! This is kind of neat, but my name is Stacie and I live in Nova Scotia, too! 😀 Just got a little giggle out of that! I may check this out. I am considering the Paleo diet, but I need meal planning ideas and recipes. Great timing! We’re going gluten-free and are running out of ideas! Thanks for letting us know about eMeals! What a great site! I am trying to eat a low carb diet and have also been getting really bored. I gave in tonight and ordered two chicken dishes from my favorite Chinese restaurant to change things up! I am a diabetic so I like that you can choose your own meal plan. I would really love the low carb diet. I’m in Canada and I couldn’t use that feature unfortunately. I live in a rural area though so maybe that was why. Any particular store for your Low Carb plan?